“In the weeks leading up to my semester abroad, people constantly asked me about my trip. Was I excited? Was I scared? I would tell them that I was excited and maybe a little bit nervous, but honestly, I don’t think I fully registered that I was going to India until the morning of my flight,” explains Molly Hubbard, a junior at Middlebury College in Vermont (pictured above on right). Molly represents a growing number of college students who are choosing to travel further afield for study abroad experiences. Further afield, not only geographically, but culturally. Vietnam, Uzbekistan, Argentina and South Africa are among some of the other destinations the students we spoke to for this article had studied in, in addition to many of the long-time European and Australian favorites. Not only are students heading overseas to less traditional study abroad destinations, but many are also seeking out opportunities to live with families and blend into (as much as possible) the local communities. Some are studying at foreign universities with just a handful—if any—of other Americans. Not only are students going further abroad, but more and more are doing multiple study abroad programs—sometimes for very short periods of time. And in addition to the traditional college semester or year abroad, they’re studying abroad as early as high school and after college--in graduate school and before starting out in the working world. Before going to India as a college student, Molly Hubbard had studied in Jordan for a six-week-long exchange student program in high school. Ben Hubbard traveled to Bangladesh to study climate change for three weeks with a class during his senior year of college. Many of the students who are choosing to study in very foreign cultures are pursuing professions in emerging and growing areas such as environmental policy, global health and human rights and peace, security and conflict issues. They are also learning languages that are beyond the traditionally obvious ones for American students—such as Hindi, Arabic and, as mentioned…Uzbek. A couple of students we spoke to have recently graduated and are further fattening up their global resumes with more foreign experiences. Christina Tabacco, a University of California Santa Barbara student (right), spent a semester of her junior year in Cape Town, South Africa. She has since graduated and is now preparing to return to Africa, this time Botswana, to participate in a 55-day-long program on safari guiding before going to law school. “I’ve been dreaming about doing it since I went on safari in South Africa,” she explains. Ben Hubbard is in Kenya, working as an intern for Global Vision International. He recently finished weeks of training and is about to be placed with KESCOM, a Sea Turtle Conservation collection of CBO’s (Community Based Organizations). While their children are jetting off to the far reaches of the world, many parents are making sure their own passports are current. Meeting their child for break is the perfect excuse for a trip and a vacation unlike any others. Christina Tabacco’s parents were able to see Cape Town almost as if residents. “You end up doing thin gs you otherwise wouldn’t do because your child is a student there,” explains her mother, Peggy Schmidt. “We rented an apartment in Camps Bay and went to all of Christina’s favorite restaurants. We also got to watch her play soccer, because she joined the University of Cape Town women’s team. It was very exciting watching…there were young women from four or five different African countries.” While in the country, the Tabacco-Schmidt family went on safari with their daughter, visiting Kruger National Park. Becca Hensley, an Austin, Texas-based travel writer was able to do a “quickie girl trip” to London with her daughter, Lizzy Williams, before taking the train to Vienna to drop her off for a year-long study abroad program. She then returned with the rest of her family and they all spent Christmas together, enjoying the Viennese Christmas markets, the music and pastries. Some families are multi-generational study abroaders. Lynn Schnurnberger, one of our contributors, recently visited her daughter Alliana Semjen in Florence with her husband Martin. “Martin had been an architecture student in Florence 32 years ago so he felt like he was passing the baton,” she explains. “The minute we knew Alliana had been accepted, we started planning our trip. Three and a half months is a long time to have your only child away from home, abroad, but knowing we would visit her in Italy certainly softened the blow!” Lynn adds that “It was amazing to have our 20-year-old daughter as a tour guide. She planned our entire trip, taking us to the leather market, her favorite restaurants, picking out our wines at dinner (she's "legal" in Italy, and one of her courses was in food and wine.)" Patricia Hubbard arranged to meet her daughter Molly as she was returning from India—for a week in Paris. “It was just perfect --mother/daughter time,” she says. Asked if she worried about having both her children traveling so far, she responded, “It’s a global world and they want to be part of it. I'm thrilled for them!" Photos: From top down--Molly Hubbard (right) with friend Nina Roumell at the Changing of the Guard at the Pakistan-India border. 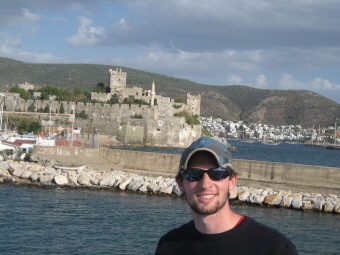 Ben Hubbard on a ferry in the Turkish port of Bodrum. 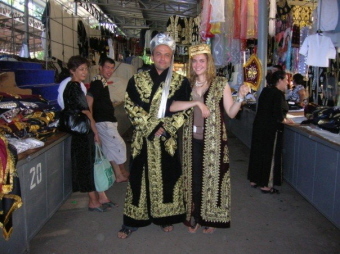 Erin Levi posing as a Uzbek bride at Chorsu Bazaar in Tashkent, Uzbekistan. 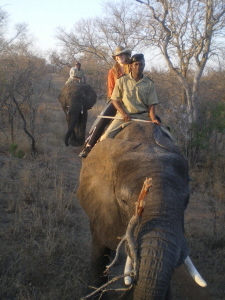 Christina Tabacco on an elephant at Camp Jabulani in South Africa. 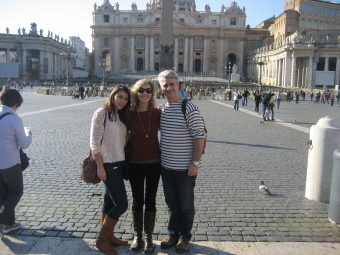 Alliana Semjen with parents, Lynn Schnurnberger and Martin Semjen, in front of St. Peter's in Rome. If you're thinking you might want to study abroad during college, here are some tips to keep in mind as early as high school. Don’t drop Spanish or French in high school or early college. Keep up your foreign language skills. Talk to every kid you meet who has ever studied abroad. Learn about their experiences. Consider a college that has a very strong international study department. Once in college, meet with a study abroad advisor and attend college information sessions well in advance of choosing a program. Choose a country or program that’s most related to your interests and long-term goals. Make sure the credits you earn abroad will apply towards your university’s major requirements. Studying abroad should not be a detour, requiring extra semesters to make up credits. If you are pursuing an athletic scholarship at your home school, find out how supportive an athletic department might be should you spend some time away. Check to see if any financial assistance you receive will be applied to your study abroad.